​ This sweet boy has my heart! KoJak is my 3rd Weimaraner, and by far has the best temperament of the three. He is super sweet, lovable, silly, quirky, and laid back. 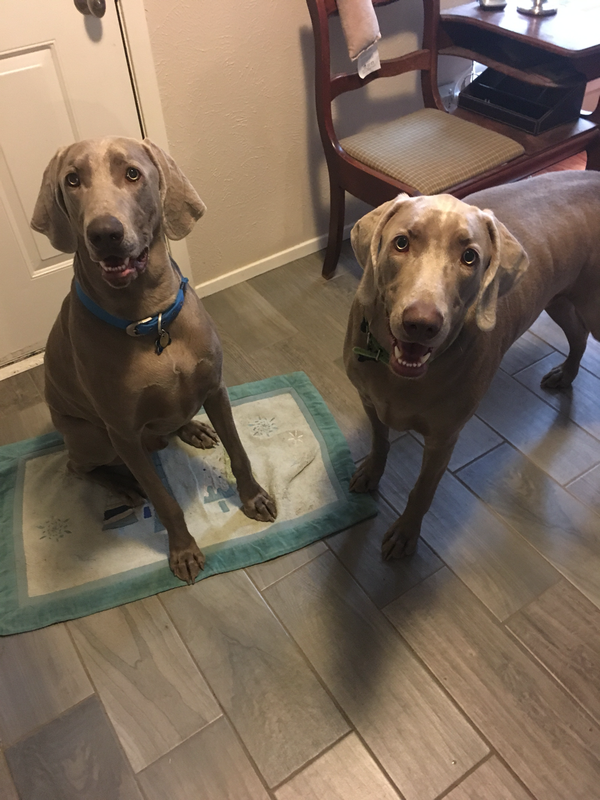 He is also the largest weim I've ever had. Kojak will be 7 months this week, and is already up to 70lbs. His green/silvery eyes and silvery coat are absolutely gorgeous!!! Mitzie Hammons, if it wasn't for you posting that handsome pic of Cooper (Kojak's brother) on Facebook I wouldn't have my sweet KoJak. Diane Anderson, thank you for blessing me with this sweet boy! I'm in love! Thank you for being honest about his hernia. Our vet said it looks great, and he doesn't need corrective surgery. Thank for all your support those first couple of weeks after we brought KoJak home. I had forgotten how to train a puppy, lol. Anderson Weims rule!!! I met Diane on my Weims group.Where I found her to be polite and knowledgeable. She happened to have a new litter and I asked if I could come by to see her new babies. I fell in love with them all but could only pick on.. My Lady Amber Von Anderson is a wonderful terror I could not live without such a beautiful girl at 7 months and a trim 60 pound. Her temperament is super and is the offspring of two great dogs. Can't say enough about her and the way she starts her babies, I could go on and on about her whole family two and four legged. Cannot express how much I love Diane! She is extremely kind & is always available to answer any weim question I have. Above all, she loves her own weims & they are her family; her extended family are her litter pups. Our Ranger was is excellent health when we purchased him & parents carry no genetic issues & were absolutely stunning in person!!! So thankful to have found Anderson Weimerinars!! Ace is currently in training for hunting. It is hard to put into words the level of appreciation I have for Diane and the love I've received from her and Anderson Weimaraners. 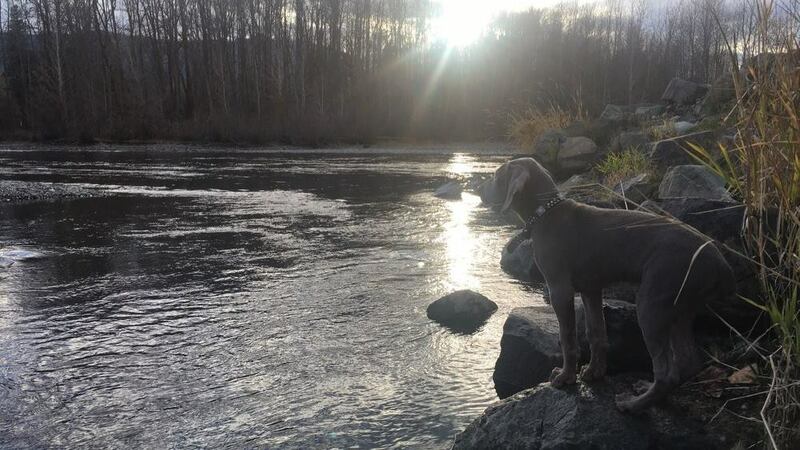 I first met Diane through a random stumble upon their website as I was in search of a new companion and hunting buddy (a search for a Weimaraner or GSP). Diane knew and understood my exuberance and excitement at once and never missed a beat in her effort to provide for me a perfect baby girl Weimaraner who I named Ghost. The process was something I will never forget. It was such a perfect Journey that was cut short with a beyond tragic accident in early December when my baby girl was taken from us from a car incident. 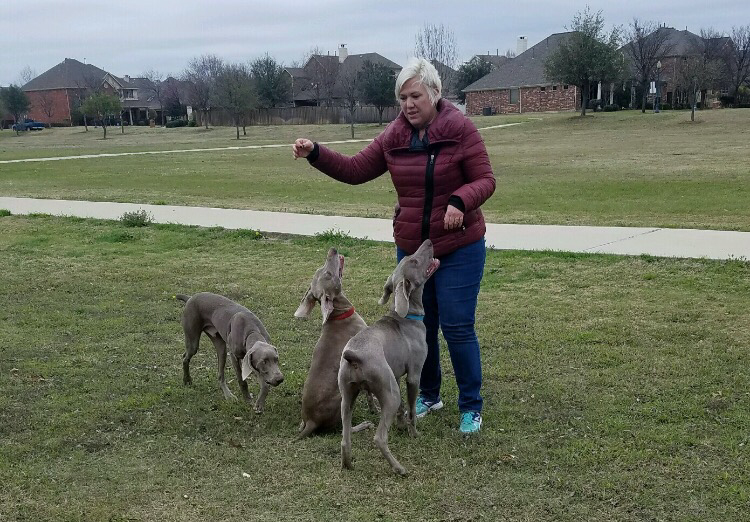 However since then Diane has been there for me as well as my family and I look forward to welcoming another beautiful Weimaraner from one of her future litters. Ghost was my best friend and she was perfect in every way. I wouldn't want any other dog from anyone other than Anderson Weimaraners. I will never be able to thank Diane and her family enough for all they've given me in memories, love and for my future best friend I cannot wait to meet. So, kinda a long story--we are the lucky family of Heidi and Kaiser's first litter. Gryph and Stella. 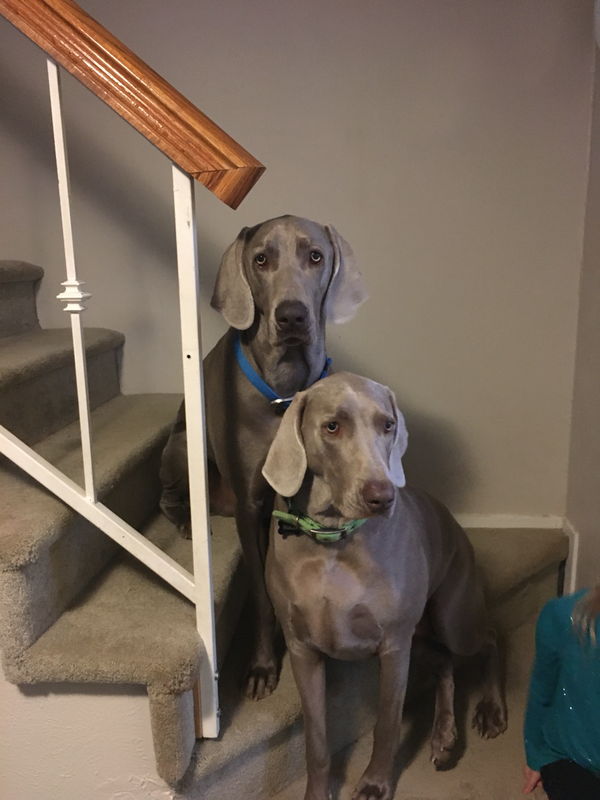 At the time of these two arriving in our lives (end of Jan 2016), we had an older pack-Stormy the Weim (resident "Diva and Queen of the Stare", 11 yrs old), Merlin the Weim (resident 'Big Papa' 12 years, our total chill dog unless you are a cat or not a dog) and Abby (resident Boxer girl aka "Big Girl" 10 years. We felt our old pack was aging and it was time to seek out some additions to our pack. My husband found Dianne and yelled from the office "Hey, there are Weim pups in Edmond". My reply " No way"...and 2 min later.."Send me the link!" and within a couple of hours we were up the road in Edmond looking at these beautiful pups. I asked Diane which pups stood out the most to her and she pointed out 'Star' and wow, what a beautiful boy with a little white star on his chest who is now our Gryph (Rogue Gryphon). Diane then pointed out who she called "Attila" whose name is still fitting. She is now Stella Mae aka the new resident Diva. We lost our old pack in a matter of months, which was very shocking. We now have this lovely new pack. Working on AKC obedience training--both graduated and we are still going. Now a year later (last week) we added a Boxer pup, Maggie May--it's been a year so we were ready. Long story short, these Weimies are now almost 1 1/2 years old and great mentors to a little 14 week old Boxer. Thank you Dianne for your ongoing kindness (she came over this weekend and chipped our boxer pup) and all you and yours have done to ensure these pups are well taken care of. You all helped turn a tough situation into something very joyous and have been along every step of the way. Thank you to someone I consider a friend and who really loves this breed. Where do I begin to explain the happiness Chloe has brought to our family... We reside in Missouri and had weimaraners breeders to select a puppy. We wanted more than a mass produced puppy. I knew the first time to spoke with Diane Anderson we had found the perfect puppy. Our Chloe was loved from the day she was born. Diane has been available 24/7 for questions and guidance on caring for Chloe. My husband Jim and I have been blessed with a smart and healthy puppy and have made lifetime friends with the Andersons.